I’ve made these a a handful of times and they never get old–Smitten Kitchen’s homemade cheddar goldfish. My only mod? Adding red pepper flakes for a kicked up, spicy, adult version perfect for snacking alongside a cold beer. If you are looking to procure a little mini goldfish cutter, here’s where I got mine. Grabbed these glasses from Easy Tiger. A great addition to our bar cart. It’s Friday. 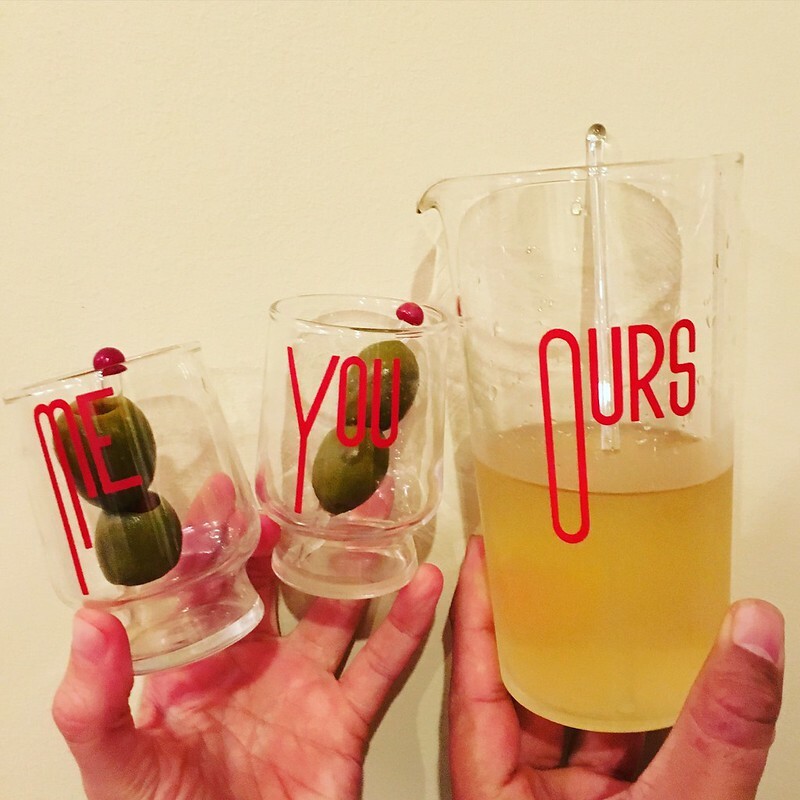 What are your favorite glasses for a nice beer or cocktail? I could drink coffee out of my Chemex every day if I had the time. This time, I tried some local, organic coffee from a roaster in Louisville, KY, that a close family friend sent for the holidays. It was delicious, to say the least, and served up in vintage mugs made in Syracuse, NY, that of course, I found doing my favorite activity next to making things: thrifting. Nothing screams holidays like extra dirty martinis in vintage mid century glasses and fair isle snowflake motifs in red and white. This hat ended up being an amazing stocking cap gifted before I could get finished snaps. It only took two evenings to knit, so I’m definitely starting another one this evening. Homemade fried tortilla chips and ceviche in my house on Fridays. It’s a glorious. glorious way to spend a Friday. I find shrimp to be one of the best, and easiest, ceviches to make at home. The shrimp take a longer time to cook in the acid (lime juice) and can turn tough as a result, so now, I’m quickly flash poaching them in some boiling salted water before submerging them in lime juice, cilantro, extra jalapeno, red onion, cucumber, tomatoes, and salt/pepper. After its chilled and soaked up the flavors, I add avocado at the last second. Always fry your own chips. You won’t regret the work. My mum and I found this amazing cocktail mixing glass and shooters recently on an antiques browse. This set is in mint condition–complete with glass stirrer and two glass picks for olives or cherries or onions. It’s a dream come true; the perfect addition to my bar cart. And it was only $20. Last night, Sean and I enjoyed our first extra dirty martinis in this new set. Cheers, indeed. Finally, home feels settled. And after years of living in the city without proper outdoor space, I have not one–but two–giant porches. One facing east toward downtown in the back, and one facing west and the world’s best sunsets. The back porch is a great place to enjoy an after work cocktail, or a book on a warm Saturday morning. I love that it feels like a living room. 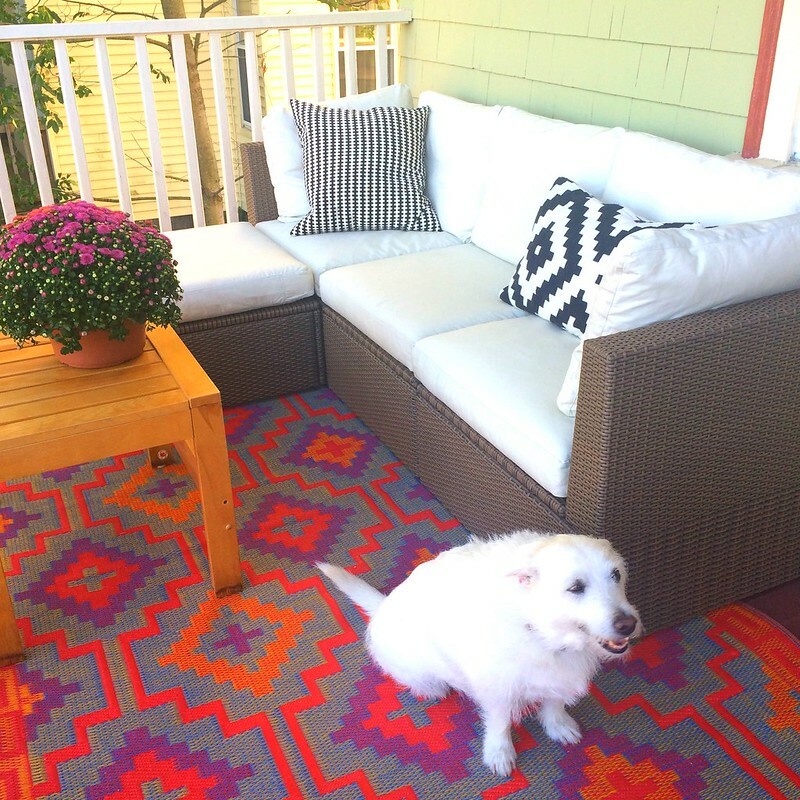 And our pooch, Jackie B, certainly loves it, too. I’m spending as many fall evenings out here as I can. 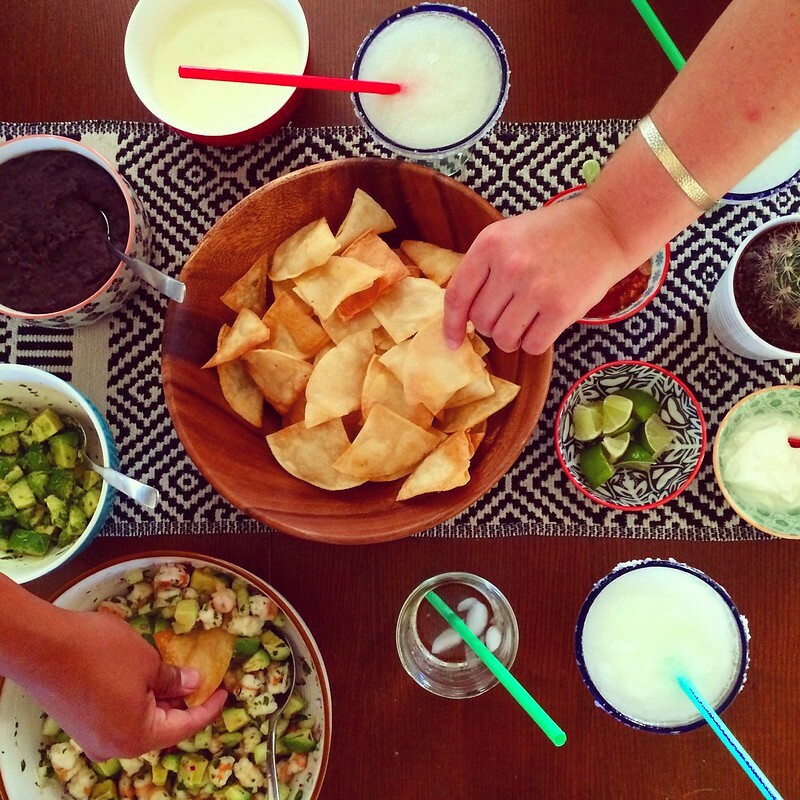 My first housewarming party was small–just my good friend Mack–and a pile of homemade nachos, ceviche, and margaritas. It was the perfect way to show one of my closest chums the new place. 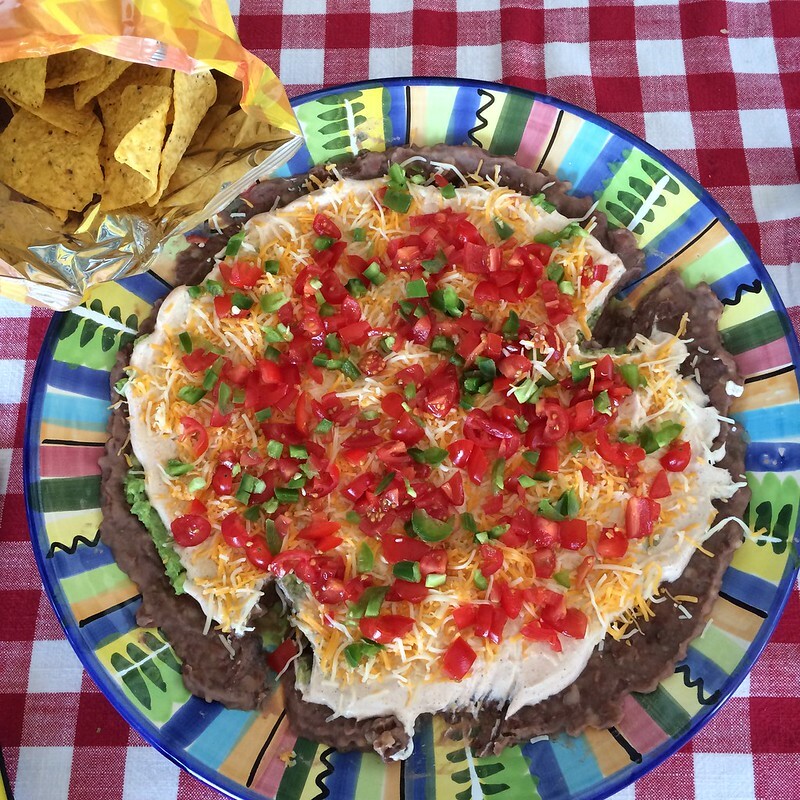 Summer is all about homemade dips, particularly this amazing layered one. Why does it ever have to end? One of my favorite mugs was thrifted. I think I randomly spotted it in a Goodwill near my home and boom, it was mine. If you know me, you know I kind of have a thing for pigs. I pay homage to all things porcine–delicately placing little pigs in small corners of my world. I’m not the kind of person that sees something with a pig on it and has to have it. I’m highly selective of my piggy products. 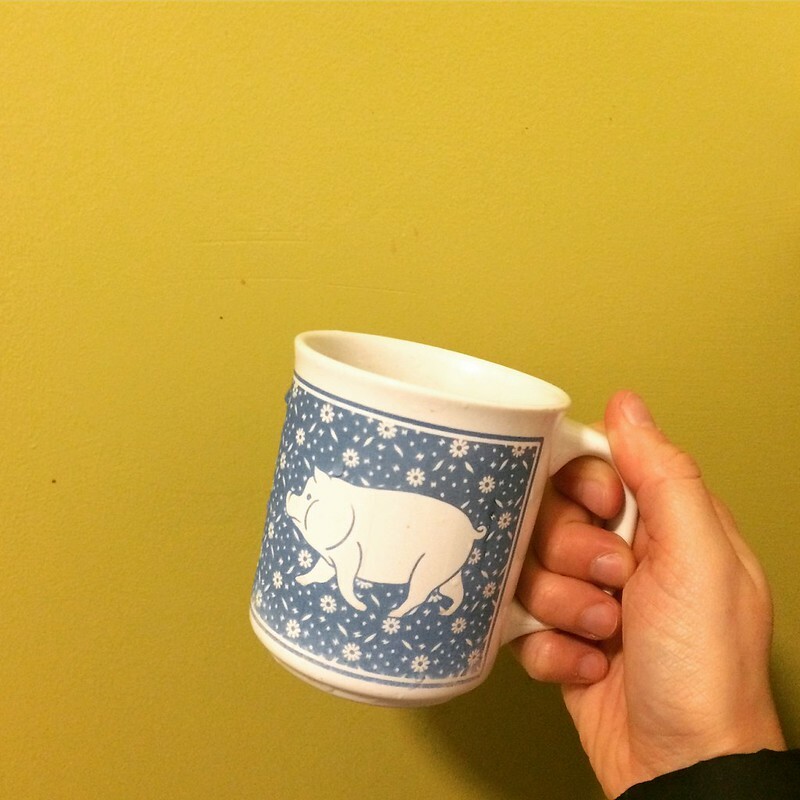 There was something about the pig on this mug, and the vintage feel, that had me hooked. It’s one of my favorites to drink coffee out of. In honor of my pig thing, I will be sharing various pig-related items I’ve picked up along the way–mostly through thrifting or antiquing. Do you have something you sort of collect?